The narrow Irish wedding ring is great for any women with Irish heritage or a fondness for Irish culture. Best of all this particular band was designed with "comfort fit". 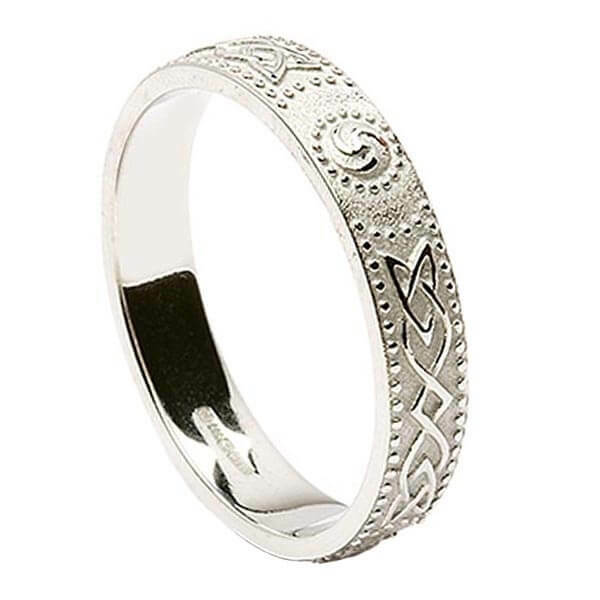 The wearer can have Irish pride, a great design, and amazing comfort - all in one ring. Handcrafted in Ireland and hallmarked by the Dublin Assays Office. Cét-chath Maige Tuired or The First Battle of Mag Tuired recounts the story of when the Tuatha Dé Danann took Ireland from the Fir Bolg. These people were some of Ireland’s original occupiers. Their ancestors, the Nemeds left Ireland for Greece to escape the Fomorians. When they returned as the Fir Bolg, they occupied Ireland for thirty years. The Tuatha Dé Danann, another of the Nemed’s descendants, came to Ireland in three hundred ships from islands located in the north. They were led by their king, Nuada. On arrival they burned their ships. Even though, their coming was already predicted by Fir Bolg king, Eochaid mac Eirc. Negotiations for the island were held by Bres of the Tuatha Dé Danann and Sreng, the Fir Bolg champion. Bres demanded that the Fir Bolg give them half the island or prepare for battle. The Fir Bolg chose battle. There was a short delay while each side prepared their weapons. Afterwards, they met at the Pass of Balgatan. The battle lasted five days. King Nuada and Sreng met on the battlefield. With one swing of Sreng’s sword, he cut off the King’s hand. This did not stop the Tuatha Dé Danann from getting the higher ground. A truce was eventually called. Once again the Tuatha Dé Danann gave the Fir Bolg options. They were given the options to leave the island, share it with the Tuatha Dé Danann, or continue the battle. Again, the Fir Bolg chose to battle. This time when Nuada meets Sreng, he will only accept battle if Sreng ties up one arm to make the battle fair. Sreng rejected the condition. This time the Tuatha Dé Danann offers the Fir Bolg one of the provinces of Ireland, and they choose Connacht. The two sides then make peace. After the battle, Nuada had an artificial hand made by Dian Cecht, the God of Physicians; however, Brigid told the Tuatha Dé Danann that no one with a blemish can rule them. This causes the people to choose a new king, Bres. Bres died seven years later, and Nuada, now known as Nuada Airgetlám (Nuada of the Silver Hand), who had his arm replaced, is restored to leadership. 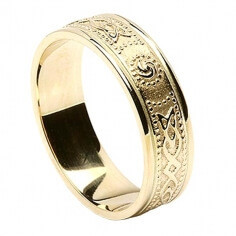 Service rating : We received our rings quickly and they were beautiful! I love them and can't wait until the wedding so that we can wear them all of the time. Product : I love the ring. It's looks so delicate, but it's so sturdy. Service rating : Since everything worked perfectly, there is nothing more to give than a 5 Star rating. Product : Customer Support is great. And that means something!!! Service rating : The ring is beautiful and Celtic Rings did a great job shipping the ring in a timely manner! Product : Pretty ring, didn't like how the outside design rubbed against other fingers. The inside was soft and smooth. Service rating : Fantastisk kundeservice. Svarede på emails lynhurtigt. Endvidere blev der fulgt op på efter levering, om vi var tilfredse med købet og levering. Billederne af ringe på hjemmesiden svarede til virkeligheden. Product : Fantastisk kundeservice. Svarede på emails lynhurtigt. Endvidere blev der fulgt op på efter levering, om vi var tilfredse med købet og levering. Billederne af ringe på hjemmesiden svarede til virkeligheden. Service rating : Excellent product, very friendly and helpful responses over email. Product : Beautiful! Just what I was looking for. Service rating : Good communication, quick shipping and very beautiful products ! Product : skinny ring, very precise job! beautiful !